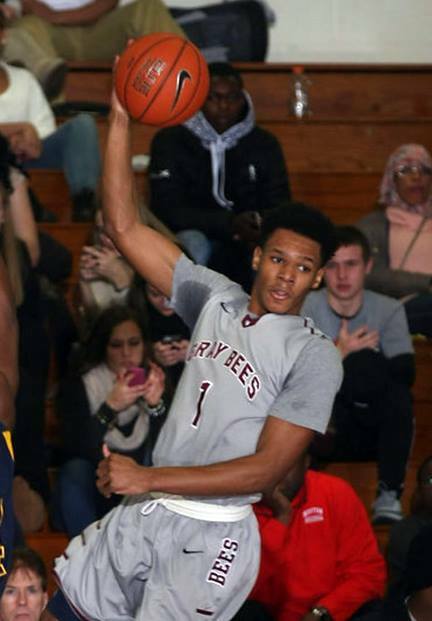 UDI Trevon Duval, pictured, scored 14 points against Peddie on Feb. 4. The Dalton Gym bleachers were filled to the brim with fans as St. Benedict’s Prep’s varsity basketball team defeated Peddie School, 61-52, Wednesday, February 4. The Gray Bees recently suffered losses against Roselle Catholic High School and Blair Academy, but were able to bounce back with a win on Wednesday evening. Their record has now improved to 17-4. The game started off with a bang as the Gray Bees outperformed the Falcons during the first quarter, 26-21. UD1 Trevon Duval scored 9 points in the opening quarter. However, thanks to their hard defense, Peddie began to close the gap in the second quarter, as they scored 15 points and limited St. Benedict’s to 8 points. “We got complacent in the second quarter,” head coach Mark Taylor said. Peddie was leading 34-36 at the end of the halftime. Afterwards, senior Eli Cain began putting points on the board for the Gray Bees, scoring 8 points of the Gray Bees’ 15 points in the third quarter. Coach Mark Taylor believed this was one of the biggest factors that helped them win the game. “I liked how we executed offense in second half; it was much better than the first half,” he said. St. Benedict’s was able to limit Peddie’s scoring in this quarter to only 4 points, which widened their lead to 9 points at the end of the third quarter. Neither team had the edge in the final quarter, as each team evenly scored 12 points. UD1 Trevon Duval, senior Eli Cain, and UD1 Nathaniel Pierre-Louis were all the leading scorers of the game, each with 14 points. The Gray Bees look to carry their momentum into their next game against Riverdale Baptist High School.